Over the course of the past year, I have had the life-changing honor of painting President Obama's portrait for the Smithsonian National Portrait Gallery. On Monday, we unveiled it to the world. I'd like to tell you a bit about it. This image provided by the National Portrait Gallery, Smithsonian Institution is of the official portrait of former President Barack Obama, released Monday, Feb. 12, 2018 in Washington. The portrait artist is Kehinde Wiley. 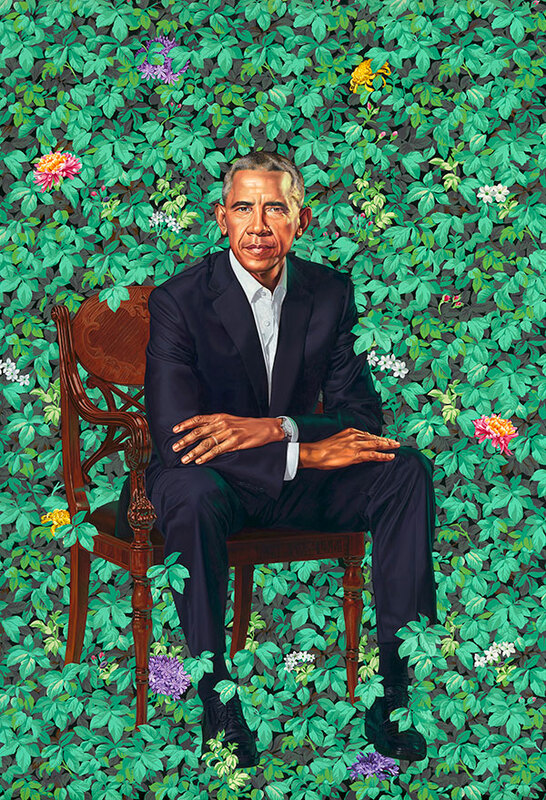 (Kehinde Wiley/National Portrait Gallery via AP)In choosing the composition and colors for this painting, I sought to create an allegorical index to President Obama's life story -- using key botanicals that reference his personal presence in the world. Jasmine from Hawaii. Chrysanthemums from Chicago. Blue African Lilies from Kenya. And the nature of the president's pose is not sword-wielding or swashbuckling. It's contemplative. Humble. Open to the world in its possibilities. A man of the people. As an artist, my practice is the contemporary reinterpretation of painting. I'm inspired by its history, by its mechanical act, and the human stories that can unfold on a physical plane. And what drives me is this notion of a history that is at once welcoming of those human stories -- while being dismissive of those that don't correspond to some accepted notion of respectability. And my aim was to use the universal language of painting to arrive at a much more inclusive commentary of our own collective potential. The particular honor of being the first African-American painter to paint the first African-American president has been, for me, beyond any individual recognition. It is bigger than me, and anything I could gain out of this. It presents a whole field of potential for young people -- particularly young black and brown kids who might see these paintings on museum walls and see their own potential. Art can function in practical, descriptive ways -- but it can also inspire in so many resounding multiplicities. That is my hope for this painting. Kehinde Wiley is a Los Angeles native and New York based visual artist.